Look like the highly effective communicator you are. Growing to new heights is an exciting opportunity and experience for all companies. Keeping your audiences interested so that they never unsubscribe is a challenge which needs high priority and creative influences. The ultimate PR productivity hack. Small changes can make a big difference. You can be more effective in your marketing today. 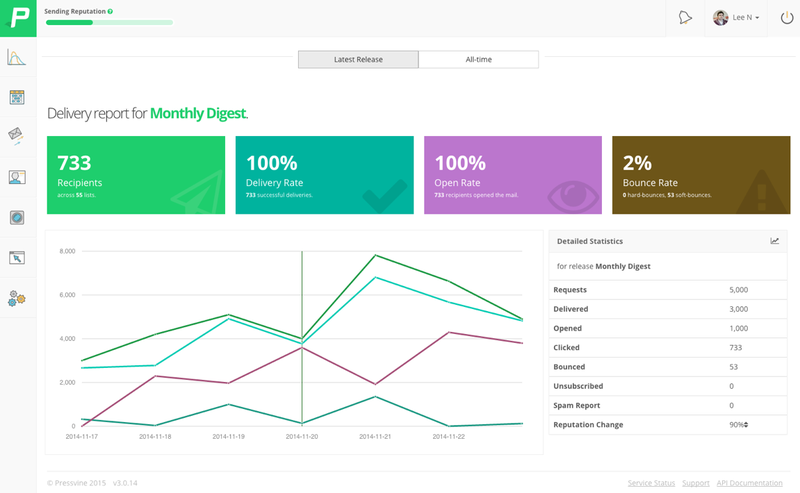 Pressvine is PR software you will actually use. Schedule your press releases to when it suits you. Additionally select a specific list of media targets you wish to target. Then sit back and track your story over all the media types available. Tailoring your news to suit your followers requires careful consideration and research. Choose consistent themes, colours and fonts that powerfully reflect your company brand. Your audience should know it's you at first glance. If they like what they see, both content and presentation, they are sure to stay and read what you have to say. Search for media contacts that can influence your most potential and interested audiences and help establish a trustworthy reputation for your company. Manage your own press releases independently without the need for an external PR company, saving you costs and gaining you expertise. Through thousands of media contacts who get reports, who clicked on them. Add your own contacts. Learn about the tricks, tools and tips to increase impressions made from your news articles. Use the online detailed statistics to analyse your potential clients, before you improve future campaigns to gain even further interest. Stop wasting time on repetitive formatting of Press Releases. Choose from one of the existing PR templates in Pressvine or create your own. You can now setup your DNS to include our Pressvine servers in your SPF record (so that your campaigns will be Trueidentity authenticated). Dedicated IP means that only you will be sending mail from this address, this further protects your brand and improves mail delivery. House all your press releases within your own customisable domain site, which you can also link to straight from your website. A neat one stop for all your hard work and marketing materials. Get detailed reports on how many people read your news, their geographic statue and how many shares it got. Track all this data on the impact of your news instantly within your Pressvine account. If an email lands in an inbox and no one is around to read it, does it make an impact? open rates dramatically decline after one hour, and less than 1% of business emails are opened after 24 hours. That’s why we've introduced, a powerful Pressvine feature that lets you schedule press releases for when they will be most effective and automatically sent at a later time. Pressvine has a built in feed tool that allows you to publish your content directly onto news sites that you have signed up to in our app directory. Pressvine has taken the headache out of image and document management. Easily upload images to your news hub once and access them without needing to repeat the process for any email press release or news story. We have made it easy for you to organise your images in Pressvine. You can create unlimited folders and tags to enable you to quickly search through your images and documents within Pressvine. Pressvine has an optional UK media database built in, users are able to search through contacts, use within Pressvine or download contacts. Your news page needs to be a dedicated platform and not simply another page within your website, it should be as powerful as it is beautiful. Your news page is the most dynamic part of your website and under constant pressure to keep up with internet changes, more than any other part of your website. What do you do if there's a new social media provider? or firefox introduce a new web browser? Your news page is not just an ordinary web page, its a vital resource and a living library of your business. A well structured news hub gives readers a real picture of what its like to be part of your business. Pressvine helps you create a stunning news hub that will never go out of date. Our developers are constantly monitoring changes to ensure that your news page never becomes obsolete or dated. This is a crucial step in protecting your brand. Pressvine will reduce your web development expenditure by outsourcing the most dynamic part of your website. Your news hub can contain multiple pages and rich content such as social shares, image library resource for print journalists and blog posts. Visitors to your news page can access all of your news, they can also navigate to other parts of your website. Journalists can download images from your image library without needing to call you. Pressvine newsrooms contain everything you need to make your company look great. In Pressvine you can create multiple contacts lists, this enables you to segment campaigns and organise your contacts in a really meaningful way. Make the most out of your existing contacts by importing them into Pressvine from CSV, excel or our gmail tool. If your news is worth sharing then don't stop at journalists, add customers, suppliers and employees to your contact list. You can then add them to your automated news digest which will keep them informed about your company and help generate more visits to your website. You can export your data in Pressvine at any time you wish and as many times as you wish. Pressvine is the first PR distribution tool available that is built on an API platform. Quite simply, this means that other relevant software providers can ‘build in’ features to our platform. The benefit to you? Constant evolution of our product features and more integrated, time saving PR functions. Integrations can be added from your admin panel of Pressvine account. Advanced subscription management allows you to embed a newsletter sign up form on your website. Users can also unsubscribe from individual lists rather than your entire mail out. So if you are a legal firm sending news about property and employment law then the user can choose to stay on one list but remove themselves from the other.